Two officials from Charlotte’s workforce development group called for collaboration to give young people the skills they will need for today’s jobs, and maybe even tomorrow’s. Charlotte Works, which funnels federal funds into training efforts, can’t do it all. Central Piedmont Community College can’t do it all. Even the organization with the most resources, Charlotte-Mecklenburg Schools, can’t do it all. Not, says Charlotte Works CEO Steve Partridge, until employers make it a priority to bring young people into the workplace through internships and apprenticeships. And parents stop giving their children negative attitudes about work opportunities that might actually match their skills and their dreams. Partridge said Forum participants could help directly by coaching their children about fitting careers to their skills and dreams, and also stepping up with their boss to volunteer to make internships possible at their workplace. 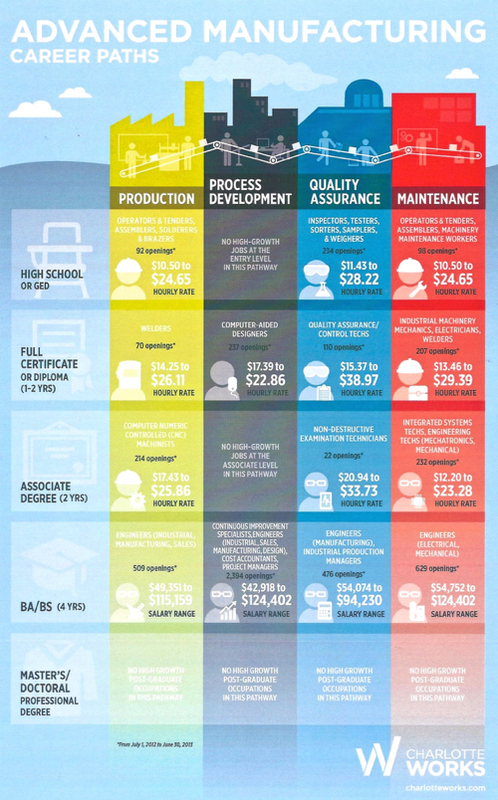 Advanced Manufacturing: A PDF of the schematic at right giving young people information about the training needed to achieve certain hourly rates and salary ranges. Youth Works: A brochure outlining the opportunities available to young people through the Youth Works program. Contact info: A business-card foldout that includes locations and contact info for Charlotte Works. The videos below contain the presentation by Partridge and a portion of the Q&A with Partridge and Frazier that followed.